Live a Colorful Life: Sold! And a giveaway! ETA: We have surpassed our goal of $1/comment--503! So we are closing the giveaway a little early. Thanks so much to everyone who took the time to leave a comment to help raise money for this fabulous organization, MCC. The winner of the scraps will be announced Saturday, 4/21/12. Today is the day. Colorbox is on the auction block. I have been preparing this quilt for over a year now. While you are reading this, it may or may not have already sold. The details will follow tomorrow. In the meantime, I thought I'd give a little rundown of how the auction works. All the money this weekend goes to Mennonite Central Committee, a very highly rated charitable organization where over 80 percent of the money actually goes to aid around the world rather than to administrative expenses. Their mission statement is "Relief, development and peace in the name of Christ," and here is a list of where their presence is felt. In their own words, "MCC strives to meet urgent needs in areas torn by disaster or war and to reach out to people forced to flee from their homes. MCC provides food, aid such as relief kits or blankets and other needed items in the days or weeks following a disaster. I'll be posting pictures of what the yearly event looks like here in Fresno, as I'm not sure I've ever done that before. Lots of food booths--so yummy--the food is donated, and help is all volunteer. 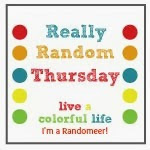 Plants are for sale, wonderful items--jewelry, decorative items--from around the world, used books, antiques, household items, you name it, it's probably here, all in the cause of raising money for people in need. There is a 5k run, a two-mile walk, a pancake breakfast. It's a place to reconnect with friends you haven't seen since the last sale a year ago and a place to meet new friends. There is music, homemade jams and pies, silent auction....and all proceeds go to MCC. Each year over $250,000 is raised here in Fresno during this weekend. It's one of my favorite weekends of the entire year. It's one of my favorite weekends of the entire year. Did I already say that? Because I have never done this before, I thought I would show the five quilts that I have donated to this event. Each has been a collaborative effort between me and Ione Ewert Whitney, Mark's first cousin, who is an absolute artist on her long arm quilting machine. 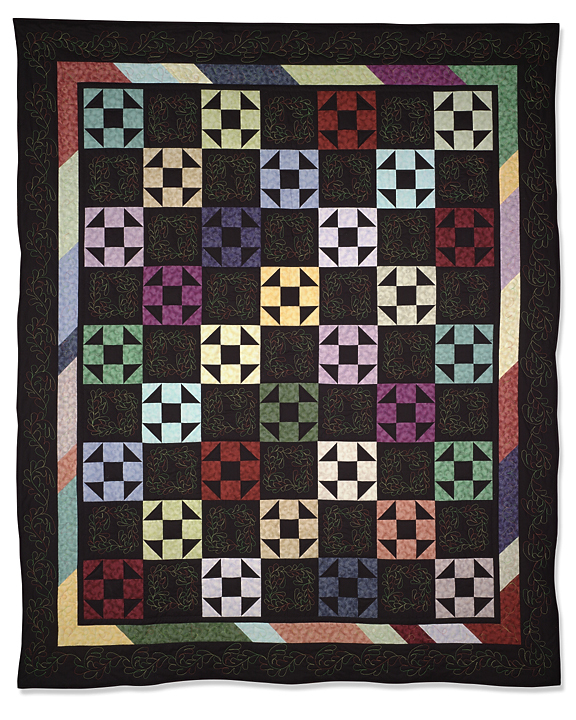 The first quilt was a simple Amish Shoo-Fly (80x92), made and donated in 2003. 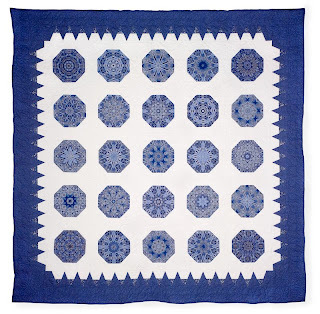 Ione had already made a quilt similar to this one and I fell in love with it, its simplicity and her machine quilting using variegated thread. In 2003 it was the quilt that went for the highest price, $3,400. Her machine quilting in the black blocks and border is just beautiful, but even so, we were both shocked that it was the highest seller. Interestingly, a beautiful hand appliqued Baltimore Album quilt (104x116) only brought $3,000. And that's what I mean when I say you just cannot predict which quilt will bring the highest dollar amount. We did another quilt the next year, 2004, Ohio Star Variation (86x113--an odd size but I had to work the body of the quilt to fit the dimensions of the border, not the other way around). There was a particular focus fabric that I just fell in love with and used it as the basis for each block. I found a pattern for the border which was a tricky but beautiful in design. This quilt sold for $3,100. The quilt selling for the highest amount that year was a hand painted whole-cloth quilt by a local Fresno artist, Margaret Hudson (96x108, $3,300). Ione and I skipped a couple of years, and then in 2007 we did Kaleidoscope (108x108). I used two fabrics by Paula Nadelstern, moving a plastic template around to cut eight identical segments for each block, to see how many different blocks I could get out of two symmetrically printed fabrics. Turns out, I was able to get twenty-five different blocks from this fabric and another similar one. This quilt sold for $2,100. The quilt bringing the highest amount ($7,250) was 100x114 and was a hand appliqued "Country Love." In 2010, we collaborated on California Garden (110x112), a design by Pam Bono Designs which is meant to look like hand applique but it is all pieced. There are 3,460 pieces in this king-sized quilt. It sold for $3,700. That brings us up to today, Colorbox. I have posted my progress on this quilt. Until I made Colorbox, Ohio Star had been my reigning favorite donation quilt. Colorbox completely knocked it off the podium. Admittedly I have had a hard time letting go of this one. It is another king-sized quilt and it is simply gorgeous (104x104). I wish you could see the quilting in person. Each time Ione sends the quilt back to me, it just takes my breath away. In case you are wondering how the auction works as far as donation, here goes: Ione charges me half of her normal fee for machine quilting, and that is her charitable donation. The quilt is assigned a "fair market value," usually around $500 for a king size, and if you have ever made a quilt of this size, you know that that about covers your costs in terms of fabric, batting, backing, etc., but certainly not the time you have spent actually making the quilt. Whatever the fair market value is, that is what I get to write off at tax time. The difference between the fair market value and the amount the winning bidder spends on the quilt is the winner's charitable donation. So if you are looking at it from strictly a financial perspective, it is a way to buy a quilt and write it off on your income taxes. Making a quilt of this size and then giving it away is something I have to "psych" myself into. From the beginning, I remind myself that this is not "my" quilt. That usually helps keep me from getting too bonded with it. MCC is a wonderful organization and the work they do is vital to so many people, those who don't have the resources for the things we take for granted on a daily basis--food, clean water, a comfortable place to live. Sitting in my sewing room, a place that is comfortable and creative, with music, audible books, good lighting, snacks when I want them...things I take for granted way too often, making something beautiful with colorful fabric...the time and the money seems like a small price to pay when the proceeds go to a much greater cause--helping those truly in need. So my hope is that two people will fall in love with Colorbox, raise their bidding numbers against each other, and be willing to pay tons of money for it. Now comes a chance for you to help. It's a giveaway! THE GIVEAWAY: One 3" WOF (width of fabric) strip of Kona cotton in each of the sixteen colors in the Colorbox quilt, plus a couple of fabric scraps in each color--fabric that was actually used in the quilt. YOUR PART: Leave a comment, and let me know your favorite charitable organization, if you have one. Or let me know if you have a given away a quilt that was really hard to let go. OUR PART: Mark and I will donate $1 to MCC for each comment left on this post. Mark sings in a 170-voice men's chorus that performs four times this year--no admission to attend, but a freewill offering is taken at each performance. One hundred percent of the offering proceeds go to MCC. This year celebrates thirty-five years that the men have been singing and they hope this year to top $500,000 in total giving from these performances. Leave a comment, tell your friends and have them leave a comment. Seriously. Please make sure that Mark and I write a really large check at the final performance of this year, April 29 in Arroyo Grande, California. We'll let RNG pick a winner for the Colorbox fabric scraps next Saturday, April 21, at 6 p.m. PDT. What an informative post! Good luck with the auction and you will definitely have 2 people bidding for it!! Have fun! Wow Cindy - good luck with the auction, your quilt is wonderful; and also good luck to your husband's choir. Wow! I'm kind of blown away for your awesomeness. Thanks for all of the auction info. I hope your quilt sells for the incredible amount it deserves! I'm a fan of Wrapped in Hope, an organization that provides quilts for children with a parent in prison. Your quilt is amazing! I love the bright colours! My favorite charity organisation is one I work for (that's why I work for them!). Galway Simon Community, we help homeless people. Hope you can get a lot to donate. good luck! My favorite charity is Elijah's Heart by Papa Joe Bradford (found here: http://papajoe.org/ ) It started out with Joe and Denise Bradford simply loving the children where they lived in Nashville and opening their eyes to all the needs around them. They are conduits for resources many in poverty depend upon--from food to school uniforms--and they love in very practical ways. They also have a children's choir that gives children an alternative use for their time and a sense of community. They are a grassroots organization, and their hearts are so full of love it's palpable. I understand how you could get so attached to your quilt. It is stunning. Doctors without Borders and the local Humane Society are my picks. we have a United Way which I donate money. and I have sold pies with the money going to our food bank. I love this quilt. It's simply fantastic that you're donating it for an auction like this. How generous of you...I wish you the best of luck. My favorite charity is The Navigators, who share the Good News of Jesus Christ, particularly to college students. My favorite quilt of yours is California Garden, although they're all gorgeous! I'm sure you'll be on 'pins and needles' until the auction is over. Can't wait to hear how your quilt does! You and Mark are two very generous people! Can't believe this is happening in my backyard and I don't know anything about it! Can't wait to hear how it all turns out! Thank you for being so giving of your time and talents. I have given away several quilts and the hardest one to let go was the one that took the longest. It had a lot of me in it! We support the Youth for Christ organization which provides drop-in centers in communities for teens where there is food, fun, fellowship and love. My favorite charitable organization is Compassion International. I'm blessed to sponsor two children through them. I'm also a fan of Mercy Ministries since I have a good friend that was transformed in their program. They have a residential program for young women who have eating disorders, drug addictions, etc., and they provide their services for free. My favorite charitable organization is Mercy Project. They are dedicated to ending child slavery in Ghana through economic development. That sounds like a fabulous cause, and a wonderful weekend to go with it, I hope Colorbox makes a very sizeable amount for them. What a lovely idea!!! You and your husband are so kind! A cause special to us is the Children's Hemiplegia and Stroke Association (CHASA). Great idea, Cindy! I love your quilts. Incredible work for a great cause. You both should be proud of your contributions. I hope you have a wonderful weekend and that the quilt raises a lot of money. Thanks for the giveaway! My husband and I donate our time and money mostly to our local boy scout council and troops. We love going camping and woking with the boys on the ropes courses we provide. 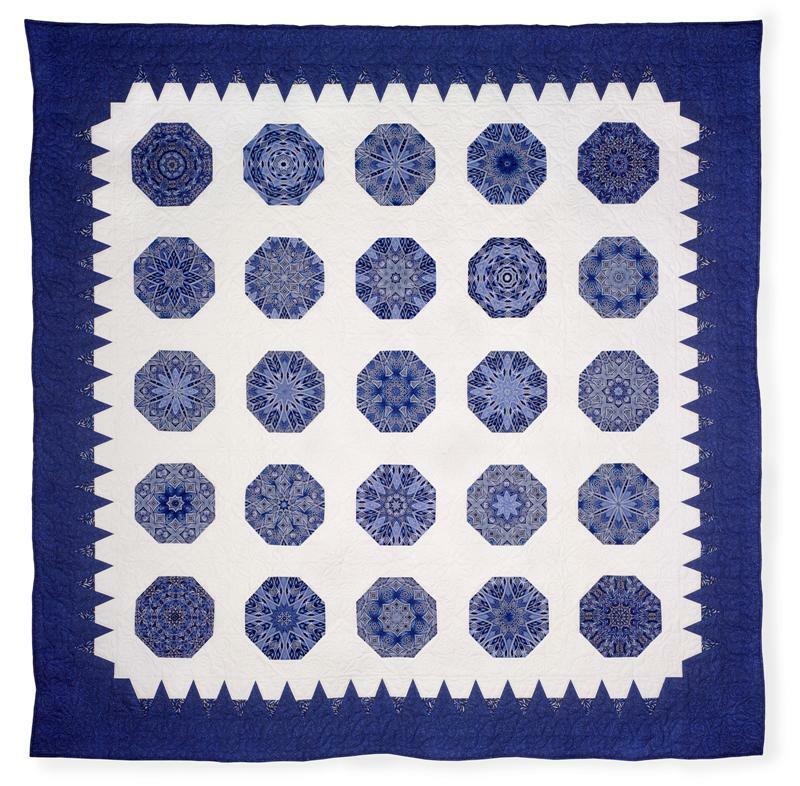 I love the giveaway, such beautiful quilts. I was inspired by reading about the quilts you have made for charitable causes. I have donated quilts to Project Linus. Colorbox is beautiful! I hope it attracts many bidders. I donated a quilt to my local children's hospital last fall, as part of the 100 Quilts for Kids drive. My next charity quilt will be for Quilts of Valor. I also aim to participate in a local quilt auction later this year, which benefits our local Hospice organization. It's difficult to part with quilts we love, but all for a good cause! Clever idea, to challenge your readers with matching dollars for comments! Best wishes to you, your auction, and the MCC. Thanks for posting your previous auction quilts. I'm glad to hear that your Fresno sale gets good prices for quilts. Here in Winnipeg we don't have a strong tradition of bidding up the quilts, so many of us quiltmakers no longer donate quilts to the auction because we don't want to see them go so low. I love your Colorbox quilt and I'd have fun playing with your solid strips. Maybe I'd make a quilt to donate to MCC for relief. thanks for the chance to win. How I wish I was loaded, financially. I would get my in-laws to come to the auctionand buy the quilt for me...to give back to you! It would be so much fun. No such luck. I like Autism Speaks. I teach Kindergarten and personally experience the hardships families face. Your quilt knocks them out of the park! It is so happy and bright. It's gorgeous! I think Mark needs to do a fused glass art piece mimicing this quilt. It would be really easy to make. ;-) kidding. I have several favourite charities, but top of the list is always one involving children... good luck to your fundraising efforts! What a beautiful quilt - hope the bidding goes sky high. My charity of choice is my local church. They do a lot of different things including helping those in the community pay for food or electricity and do so in such a wonderful way. Oh you make me want to go this year and spend a wad!!! Well, I've certainly never given away anything as beautiful as your color box quilt! Probably because I've never made anything that beautiful. I'm okay with donating items that I've sewn, quilted, knit or woven. Items made from my handspun yarns are another story. I simply can't part with them. My favorite charities are those that work with children, especially Plan international. Besides our local church, we have supported Kids Alive, World Vision and Samaritan's Purse. Our latest addition is Shepherd's Ministries, which provides Christian care and vocational training for adults with development disabilities. There are so many worthy charities. Thanks for sharing your story. I donate to the Canadian Cancer Society & the MS Society regularily, two diseases that have affected me personally. I donated a quilt to the local NICU last year, in honour of a dear friend. It was hard, knowing that it would be in the hands of parents going through such a hard time. I wonder what happened to that little baby sometimes...although my info was included with the quilt, I have never heard from the parents. The quilts are just beautiful. Such a great cause. My favorite charity is an orphange in Guatemala called Casa On The Rock. My daughter, who is a teacher, goes there each year with a church group to teach Bible School. The other favorite of mine is Samaritan's Purse who does the Operation Christmas Child Shoebox Ministry. We love packing the boxes with gifts for a child in some other part of the world and help to spread the gospel. I am a beginner quilter so I haven't donated a quilt, but it is something I would like to do someday. What a beautiful quilt! Hopefully, it will set records. We usually donate to Doctors without Borders, the local food bank, and some sort of international crisis each year, as well as donating blood. Hard to pick a favourite though, they all do good work. Color box is a gorgeous quilt! Can't wait to hear about today. The choir must sound wonderful, too! I am a fan of the Humane Society. Also of a program at a women's prison that teaches women to groom and train working dogs. We have an annual fund raiser called Harbor Hounds where you pay to enter to walk the harbor and visit booths - pet stores, greyhound rescue, dog washing, yard fencing, dog trainers, the Prison Pet program, etc have booths. Duke and I enjoy supporting it! Proceeds go to the Humane Society. You are doing a beautiful work! My favourite charity right now is a private one that I was privileged to help make layettes for; poor mamas with new babies in Romania. We've had a bunch of ladies come together and make quilts for our local Pro-Life society. It was a fun night and the charity was so thankful. I'm so impressed that people bid so much! I've heard disappointing stories about quilts sold at auction for such low prices-not enough to even cover the fabrics! I can't say I really have a pet charity-I tend to donate to local Hawaii charities that help people. Love your quilt and your generous heart! I have too many favorite charities to mention but mostly we are givers to our church and its charitable endeavors. I'm making a quilt for a silent auction right now that will support our youth in a ministry trip. I hope your quilt fulfills its purposes. I'm a big fan of CARE Canada. They do a lot of work, particularly for women and children, in the third world. Most of the things they do are about helping them get a start as opposed to merely handouts. I agree, though, that MCC is a wonderful organization. My boss has done some work for a a couple different MCCs; the events they put on are fantastic! I love to donate to MCC too! Your quilt is so gorgeous! Anyone would be lucky to now this treasure. I hope you do well today! I think my favorite charity would be a local one called Angel's Wish, which is an animal shelter that finds foster homes for stray pets while they wait to be adopted permanently. We got our cats from that organization. Enjoy your big day! You've put a lot of compassion and prayer into Colorbox, and I hope it reaps an enormous contribution to this good charity. Kenya Connect matches stateside schools with Kenyan schools for cultural interaction, and our schools raise funds to build toilets and wells and books and supplies. Our teachers spend their own money to go there and train/encourage Kenyan teachers. Seeds of Hope International and Lifewater drill wells and teach hygiene in central Africa. I loved reading this post! I appreciate the time you took to let us experience this wonderful event and I can see why it would be a favorite weekend. One of my favorite charities is Heartstring Quilts; members make blocks, or whole sets of blocks, or backings, or quilts to benefit those who have a need for them. I love the post from today, love the quilts and absolutely all what you said..., my fave charity has to be the Red Cross..., hope you get lots of comments!!! Its gorgeous. I love it. I have just signed up to the Siblings Together project mentioned by Flying Blind above. I could really do with more gorgeous plains to add to the quilt top I am going to make. The quilt is a beauty - good luck in the auction!! I live in a very small town, so the charities are limited however, we do raise money for Cancer Care patients and the Humane Society!! LOVE your Colorbox quilt, Someone is going to be very happy tonight!! I just signed up for the Siblings Together project and that will be the first quilt I give to charity - certainly not the last! Thanks for the chance to win your scraps - I need more solids in my scrap collection! Your quilt should bring in a lot of funds...it is so wonderful! I don't have a favorite charity, they are all so wonderful! I run my own teeny-tiny ministry where I digitize and machine embroider footprints/hand-prints for parents that have lost their baby. I occasionally do a baby quilt for free also. I don't have much cost except for the shipping and some moms and friends have chipped in some nice donations. The most difficult quilt for me to do for an school auction was a stain-glass window quilt I did for my PTO board. We painted individual crosses with fabric paint and I incorporated it into one large cross. My husband actually bought it, but then we donated it to the school to hang in the library. I loved that quilt, but at least I can go see it whenever I want! Hope your quilt brings in a lot of revenue!!! How wonderful you are to do this. I give quilts to charity and actually had one auctioned this year. I am not in your league as a piecer and I certainly am not on Ione's league as a quilter, but I was still happy to help in my own little way. The best part was it was the highest selling item in the auction. I aspire to be a great all round quilter some day, but there may not be enough time in my life to get there. Love your color blocks quilt! SO Happy and bright. I had given away a quilt to a 1 year old little girl a few yrs ago and to this day I still wonder what it looks like after its been washed and loved! Congratulations on bringing in the largest dollar amount for a quilt at the auction today. The process has been inspiring from beginning to end! I think MCC is a great organization so toss in a dollar for me! Cindy, I am just amazed at your generosity! The quilt is gorgeous and I'm sure it sold for a great price. I can't wait to hear all about it. Some of my favorite charitable organizations include the local humane society, the World Wildlife Fund, and the MACC Fund, which is a local charity fighting children's cancer. My sister gave away a teddy bear she had to a little girl when she was evacuating Fukushima, Japan last year. She felt that little one needed it more than her and was awed at the little girl's joy. I can not even imagine the joy and warmth this quilt will bring to a family who may have not much more than this quilt to provide comfort in a time of great need. I am starting a knitting project for the Addis Ababa Fistula Hospital. A women's hospital to repair injuries from childbirth. I loved the quilt show of quilts you gave away. I started reading you on the California Garden quilt--I remember it so well. I have nothing to add, just wanted to say I loved your post. I'm going to call you now (just got home). Loved this post! Oh Cindy what a gorgeous quilt you've made. And thank you for sharing all those others too! WOW! I have two special organizations that I donate to regularly: Medecins Sans Frontieres (Doctors without Borders) and Frontier College, which is an organization devoted to literacy. May your quilt find generous souls who love it. Thank you for the chance to win and the donation for my comment. gorgeous quilt cindy - and a wonderful thing to do - especially as often as you do. i'm a 'do good stitches' quilter so we make a quilt every month for charity - but usually only only 2 blocks, unless i'm the quilter that month. What a wonderful quilt and how generous to give it away to a worthy cause. I am a volunteer at the Pearl S. Buck House in Perkasie, PA. Our volunteer association raises money for Pearl Buck International and supports programs for children in other countries. Millions of lives have been improved by their work. All of your quilts are beautiful! I donated a quilt to Relay for Life this year. It was my first donation quilt. I had to remind myself too that it was not for me! Good luck to your charity. Sounds like you guys do an excellent job on raising money for this worthwhile cause. So fun to read about the quilts. 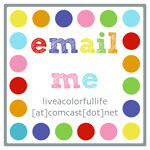 I live in your area and started following your blog just about the time the last block of Colorbox was finished. I went to the auction just to see your quilt. Pictures do not do it justice. Simply gorgeous! Can't wait to hear the results of the auction! Such a beautiful quilt!! Sounds like a great organization and a fun event. I actually grew up in Fresno and had never heard of this. Thanks for the recap of past quilts. I can only imagine a Margaret Hudson quilt! I like giving to the LDS Church Humanitarian Aid Fund. (the Mormons) these funds are used in their entirety for aid around the world. Seriously its amazing how much good they do and people usually dont ever hear about it until they are helping you! Congratulations! You've done a really good thing for a great cause. I make quilts for Quilts of Valor and also a local charity called Basics. My friend Victoria of "Bumble Beans Inc." has promised hundreds of quilts for families starting over and I have given many to them. thanks for the chance to win those colorful scraps to make my own colorbox mini. Congratulations to you and your husband for making the world a better place. I am honored to do a tiny part in helping this great cause. Your charity quilts are breathtaking! I think It's so nice that you have made it a family affair. Good luck with the auction. And thanks for the chance to win the scraps. Best wishes that you have a bidding war to raise more funds. I like to make lap quilts for our church donations to the VA in an county and a local nursing home. As a slow hand quilter it is tough letting go of any of my quilts, albeit none are as wonderful as the photos you posted. Scraps are always appreciated! Thanks for the chance. Your quilt is beautiful. I heard that it sold for a phenomenal amount to be given away to MCC. You are an inspiration to me. Wow, those are some impressive quilts! Something to work towards, I guess. I'm not sure I have a favourite charitable organization - I try to donate to various different types of organizations and in different places, although I make sure that the ratings are high for every one I donate to. I know MCC is one of them, so toss in a dollar for me. When I was in university I used to like going to the local Mennonite fall fair, and there was always a silent auction with proceeds to the MCC. Thanks for sharing all the quilts you have donated. I'm collaborating with others at the moment for my first ever donation quilt (and only my 6th quilt ever) here in Singapore. It is going to Australia's Biggest Morning Tea for Cancer Council. Good luck with your auction. We support Samaritan's Purse. Your efforts are amazing! All the monies you spend for supplies, then the time spent quilting, and now donating according to comments. Wow. I'm impressed. You are extremely generous. If my comment is picked for your giveaway, please pass the win along to someone else. Thank you! making & donating quilts to local needy families and groups. Well done on your efforts this year. I've no doubt you will bring a blessing to many. Hope your colourbox quilt raises a phenomenal amount, it's beautiful. I am posting off a quilt this week. Your Color Box quilt is amazing. The reason you made it is even more beautiful. I hope you can raise a huge amount. I love to help AMI, its an international association that sends doctors and nurses to help all over the world. What a wonderful idea and a fabulous quilt! I like to support a local charity set up in memory of a local doctor - the John Buckley Memorial Trust! What a wonderful quilt! I'm sure there will be several bidders on it. I like to support the American Heart Association since heart disease runs in the family. What a gorgeous quilt! I recently donated a quilt to be auctioned to raise money for a family who's infant daughters have been diagnosed with a terminal auto immune disease. It felt so good to do something, anything for these poor people. Your quilt is fabulous and is sure to go for a huge amount. I am in the process of finishing a quilt for Siblings Together, and help other quilting friends on a smaller scale with blocks and baby quilt tops for their charities. I like to support Cancer Research as I have lost so many friends and family to cancer. I am a passionate supporter of the Women's Institute for all they do to improve the lives of women around the world. What a stunning quilt and wonderful that you can give it away! Well done. My favourite charitable cause...at the moment it's Siblings Together in the UK, I'm working on making some quilts for the children to take home from camp this year. Wow Cindy!! You're amazing, and so is your quilt!! We support Epilepsy charities as much as we can. Mainly Epilepsy Action. Our eldest daughter has severe epilepsy. Please be kind enough to enter me in your give-away. Just so's you know, if I were lucky enough to win the fabric, I would be using it to make quilts for the 'Siblings Together' charity -quilt makes for children who are fostered and seperated from their siblings. It's not a charity I had heard about until 'Lily's Quilts' told us about it. What a beautiful quilt, and lovely post. Thank you for sharing the "heart" behind the project. I support a number of organizations that bring relief and kindness to this world. The LDS Church steps in after disasters, and it sounds like the Mennonites are doing similar work. I also support Doctors Without Borders, and the Humane Society. It's amazing how many people are out there, doing good, isn't it? Love your latest quilt! I hope it raises ons of cash. Best of luck. There are so many great charities out there. One close to my heart is The Royal British Legion (with whom I hope to become a volunteer case worker. )It is a charity that concerns itself with veterans needs and as my other half has spent his entire adult life in the armed forces it seemed a fitting charity to get involved with. Hi Cindy, great quilts, great work for a great organisation: MCC always does GOOD. My favourite quiltdonating charity is Siblings Together at themoment. In mycountry, the Netherlands, are several for children in hospital or for the parents of a still born. There are soooo many GOOD charities! And if I'm honest: love to win those strips & scraps! What a stunning quilt! My favourite charity is ClicSargeant that helps kids with cancer. My friends son with leukaemia has benefited loads from them and also raised over £100,000 for them recently! Well done Ted Rice! I hope Colourbox breaks the record for you - it will make you feel better about parting with it. I am making a couple of quilts for Siblings Together and have been making blocks for Judith's Bee Blessed! It is enjoyable to use our favourite hobby to do some good! Your donation quilts have just blown me away. Theyare treasures and I can see why they do so well as a fundraiser. I bet Colorbox will raise the highest amount ever this year! It is stunning! Congratulations for making such a difference! And thank you for the chance to win your jelly roll! That really makes me want to make a sampler quilt, which I've never thought before. My favourite charity is probably Forest & Bird. They do a lot for conservation in New Zealand. The colorbox quilt is beautiful. I commend you on your continuous support of deserving causes. My favorite charity is any of several food banks in my community. I would certainly love to have your scraps. Thank you for the chance to win. What a beautiful quilt! It looks like you made paper pieced roses in each block- Lovely! My favorite Charity is the American Heart and Lung Association. I have also just heard about the Live a Siblings Together Project. That's fantastic! The quilt is beautiful, and as a Mennonite, MCC is one of my favorite organizations - so great to hear you post about them! We also love Heifer International, World Vision, and Compassion International. What a stunning quilt and what a fantastic amount to get for the charity. Charities I support include the local Hospice and the Foundation for the Blind. Cindy, the quilt is wonderful. I hope that the auction goes well and makes lots of money! I have never made a quilt for charity as I have only been quilting for a year. Beautiful! And so good that it sold well for the charity! My favourite charity to donate to is Medicines Sans Frontieres (Doctors Without Borders) for the work they do among people who die for such small things as we take for granted: clean water and basic medical care. I actually have two favorites that are both local. One is Angel House which provides temporary shelter to young girls who have been removed from their home for whatever reason and for whom foster care could not immediately be found. I also love Welcome House who provides shelter and services for battered women and children in our county. Our girl scout troop (my daughter's) always supports one or the other each year. I love this quilt. Congratulations on earning so much money for a good cause. I am personally a supporter of Special Olympics! What an incredible gesture of charity you have made to the Mennonite Central Committee over the years. The monies made from your beautiful quilts have made a tremendous difference in the lives of so many who are in need. Blessings to you and yours for your incredible charity. What an amazing act of love! (And a great exercise in letting go..). I don't have a favorite organization but I'm always on the lookout for someone who needs a block or two. Otherwise, I'm busy making quilts for my students! If they spent as much time on grammar as they do on having fun.....oh, a girl can dream! Love to make and donate quilts to my local guild. They give them to several local charities. It is definetly hard to let some of those beauties go! You and your husband are so generous! That's incredible. Lovely quilts! My favorite charity is Focus on the Family or Compassion. 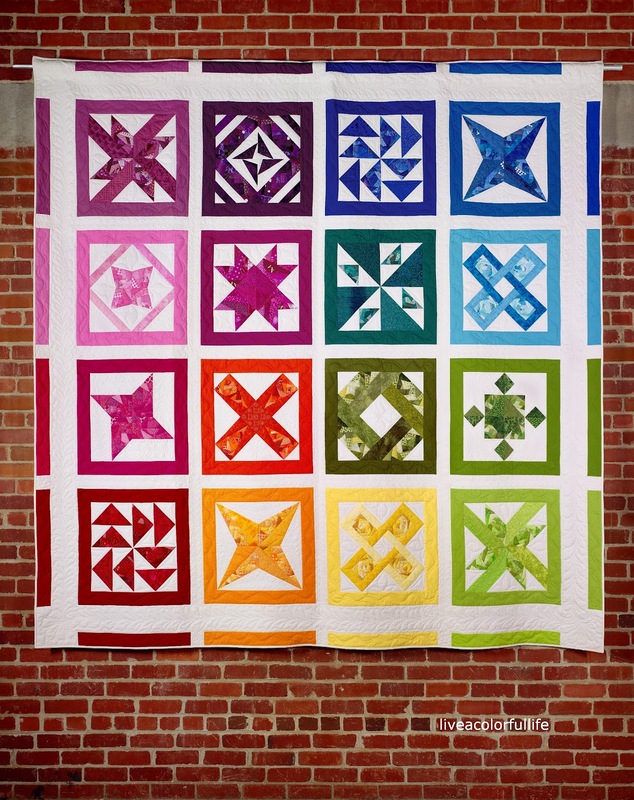 Love your quilt, it is beautiful and I would love to win its scraps! I usually give to animal rescue organizations and Big Brother/Big Sister. What a beauty! Thanks for the info on MCC. I live in Bakersfield, but never realized it was such a big deal. Good to know! I am active with Relay for Life, so that is my charity of choice. My favorite way to give to charity is locally and to donate at least 2 quilts a year to a children's shelter. It is hard to give away most of my quilts b/c DH claims them all. what a lovely quilt. Good luck with the auction! We support a cvariety of charities including MCC. Wow, that's awesome. I am very familiar with MCC, being of Mennonite background, so the idea of donations to them is great. I have made several donations to our local hospital foundation, which I like because then I know that what I make is going directly to someone in my town. I just read your post about the auction. The winning bid for your quilt must be a new record. That's fabulous! My favorite charity is Doctors Without Borders. wow! that is lovely quilt and an awesome way to give of your time and talents. I like to contribute through my church. The Church of Jesus Christ of Latter Day Saints. They have a huge welfare program and are often amongst the first to render aid after natural disasters. I read about the final auction number -- that's gotta feel absolutely wonderful that your hard work went to bringing so many precious dollars to a good cause! great incentive and gorgeous quilt! i hope the auction goes well!! My favorite charity is Kiva which does micro loans to entrepreneurs worldwide. Not really a charity since you get paid back and have the option of re-lending. Thanks for the giveaway. This is an awesome organization. I have never made or given a whole quilt to a charity though I have made blocks that have gone into larger quilts for charity. What great quilts! And the weekend sounds fantastic! My favourite charities are RSPCA and PDSA (they help animals that are sick or abandoned), The Samaritans who provide confidential emotional support in the UK and Ireland (http://www.samaritans.org/?gclid=CKO2o7Dzua8CFYwMtAod1UBFjQ) and The Fellowship (a Catholic organisation that helps people of all ages who have special needs or who are vulnerable). If I win please give the prize to someone who will use it for a charitable cause, like Judith's Bee Blessed, Siblings Together or Project Linus, etc. Good luck with the fund raising! Beautiful work. I've donated quilts to Project Linus and local shelters. Action Kivu also does some great stuff empowering people in their own lives! gorgeous quilt! your generosity is awesome and inspiring! i donate to the library, senior center and the local qutekcak tribal association. i give my handwork to the tribe. I love Samaritan's Purse - they have so many ways to give to others! Good luck with the auction! Your work is beautiful! I can't wait to hear the outcome! Congratulations on the success of your stunning quilt at the auction! There are so many worthy causes out there. I hope to support Siblings Together this summer by making a quilt. I'm touched by the generosity of the worldwide quilting community. Best wishes for your husband's singing performance and thanks for your sweet giveaway and donations! We support a Christian children's fund called Chalice. We believe 100% in what they do, which makes it so much more rewarding to be able to share with them! Thank you for sharing with us, too! So very generous of you to share your time and talents. Wow you are so generous with your time! My favorite charity is the Humane Society, since I have cats but no children, all who I got from their shelters. I hope there is no END to the comments so the check is giant! Much success in your generousity. Hopefully, you will exceed your goals. All of your charity donation quilts are beautiful, but this Colorbox quilt is my favorite. I just love how you mixed the scraps to make a single colored fabric--I must try this technique. I think today that the more modern quilts will bring more money, even though I personally love traditional quilts. There are so many worthy charities that it's difficult to choose a favorite. However, since I volunteer at the Metamo4ic Math Center in my community, I will say it's my favorite. I've never had angst about giving up a quilt that I've made for charity, but I have had that feeling about quilts that I've made for loved ones. In particular, I wanted to keep a Plus quilt that I recently made for a new grandchild of a longtime family friend. I loved that scappy quilt so much and it was my first real successful FMQ quilt. What a truly touching reminder of the kindness that exists around the world every day!! I'm just blown away and your quilt is really fantastic!! Great colors and pattern!! I want to wish you the best of luck and am happy to contribute my comment to the cause! What a beautiful quilt and great charity work. I have made several quilt blocks for different charities, made a quilt for the auction at our church benefitting the youth group for a mission trip, and 5 quilts that went on mission trips for families in Mexico. I also work with Samaritan's Purse on their Operation Christmas Child project. What a gorgeous quilt and a wonderful giveaway. I've made blankets for the Snuggles Project before (http://www.snugglesproject.org/) and I really should make another one soon. I used to work in an animal rescue shelter so I know how much those blankets help. I'm trying to find the time now to donate a quilt to Siblings Together. Hopefully this month. I am currently finishing up a quilt for a autism program so I am sooo happy to see others who do quilts for donations. 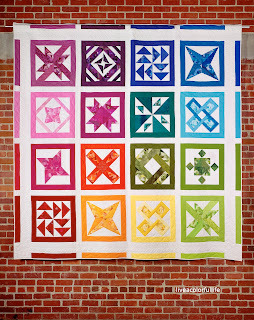 I love, love, love your color box quilt! I can't wait to see how much it goes for. I like to support our local MCC thrift store. Just watched the auction video - incredible the $$$ your beautiful quilt raised!!! Congrats! I have made quilts for Project Linus, QoV and Basics - and I try to quilt some of my quilt guilds charity quilts. It just feels good and I truly believe we can / will change the world: one quilt at a time! Aid Sudan is my favorite charitable organization. Love your quilt! I make quilts for our church quilt ministry and have given away some that I really loved. Great giveaway! My favorite non-profit is Rescued Racers here in St. Louis. Color Box is gorgeous! I support Women for Women and Doctors Without Borders. Gorgeous quilt! I support The Salvation Army and Medecins sans Frontieres. 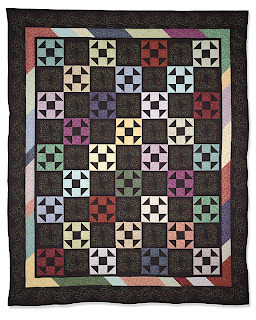 Congratulations on the auction price of your beautiful Colorbox quilt. I make the largest $$ donations to UNC Public Television. And I'm making quilts for my guild to donate locally to the Meals-on-Wheels program. Oooh, so close to 200! I hope you get one more! The quilt it gorgeous and I'm thrilled to see it went for an appropriate amount!